ANOKA, Minnesota - The industry’s number one new caliber from the number one rifle ammunition brand continues to grow. Federal expands its options for 224 Valkyrie with three new loads: 80.5-grain Gold Medal Berger Hybrid, 60-grain Hornady V-Max and 78-grain Barnes Triple-Shock X (TSX). All will be on display during the 2019 SHOT Show (Booth No. 14551), January 22-25 at the Sands Expo Center in Las Vegas, Nevada. 80.5-grain Gold Medal Berger Hybrid—This competition load features an advanced Hybrid OTM boat-tail bullet with an extremely high ballistic coefficient to provide the flattest trajectories, least wind drift and drop, and world-class long-range accuracy. It uses Gold Medal match primers, Federal brass and specially formulated propellant. Gold Medal Berger Hybrid loads adhere to Federal’s strictest specifications for accuracy, pressure and velocity. 60-grain Hornady V-Max—Destroy everything from prairie dogs to coyotes with the precision of Federal Varmint & Predator. The new loads bring the accuracy and explosive expansion of the proven Hornady V-Max bullet, loaded with Federal’s extremely reliable brass, primer and propellant. 78-grain Barnes TSX—This proven all-copper hollow point groups tightly at long range and delivers consistent, lethal expansion. The monolithic bullet design retains more than 99 percent of its weight on impact to penetrate deep, and its grooved shank minimizes barrel fouling and improves accuracy. 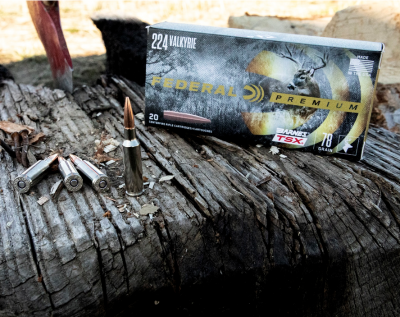 After years of development, Federal introduced the 224 Valkyrie cartridge to the world in fall of 2017. It became sanctioned when the Sporting Arms and Ammunition Manufacturers' Institute (SAAMI) voted to approve the 224 Valkyrie as an official new cartridge during its committee meeting at the 2018 SHOT Show in Las Vegas. In 2018, the Federal-designed cartridge became available in four of the company’s proven product lines, Gold Medal Sierra MatchKing, Nosler Ballistic Tip Varmint, Fusion MSR and American Eagle TMJ. This variety offered serious options for competitors, long-range target shooters and hunters pursuing varmints up to deer-sized game. The cartridge takes the long-range precision and ballistic performance of the MSR 15 platform to unheard of heights, with extremely flat trajectories, supersonic velocities at as far as 1,300 yards downrange, and match-grade accuracy.